Did you know you can now order your Deliveroo takeaway from La Cave here on View? 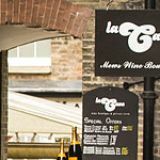 "La Cave Private Room is situated opposite Mews Art Gallery and can accommodate up to 15 guests for lunch and dinner, or up to 25 for a standing reception. 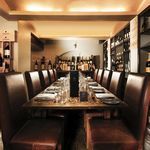 Doubling up as a wine boutique and a Bespoke Wine Retailer, La Cave is a private room with a difference, with its dark wood and brown leather seating it creates the feel of a gentleman’s club, complimented by the exquisite bottles of Wine and"
What did you think of La Cave? My husband and I visited for our anniversary, it was very quaint and relaxed. We knew it was going to be a pricey night but it was a special occasion and we weren't disappointed. Food, service and wine were worth the money. A Lovely evening. 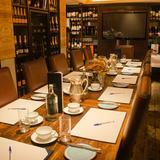 This wine boutique in Mayfair comes from the stable of Steamroller restaurants which features Hush restaurant and bar. 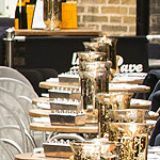 La Cave is situated just off Brook Street in a secluded courtyard where you will have the chance to dine privately with your own sommelier and individual chef delivering an array of predominately French dishes to whet your appetite. The interior is very French, with lots of brown leather, robust furniture and neautral walls providing a sleek and contemporary finish. There is an added bonus of a wall scattered with plenty of wines that are certainly there to tempt both you and your wallet. As this is only a petite venue it is really who you are with which makes the ambiance. An ideal choice for a private function whether it be office party, work function or sealing a deal this little gem is perfect for several occasions. There are set menus ranging from £55 to a stonking £85 which aren’t on the cheap side but the execution of dishes is worth every penny. The wild mushroom and tarragon broth is simply divine. Clear in consistency and bursting with flavour, this is certainly a five star dish. Meanwhile the sea bass comes with a selection of well cooked aubergines, fennel and basil and is finished off with a reduction that incorporates sweet cherry tomatoes. The combination of vegetables works well with the soft texture and the reduction infuses into the dish to lift the overall depth and flavour of this simple plate. To finish the Mars Bar cheesecake comes with cinnamon creme fraîche that will simply make you want to dash into the kitchen and lick the bowls clean. The cheesecake is soft and fluffy and the cinnamon spice enhances the overall dish. There’s a wide range of champagnes from vintage and non vintage to cuvee. The ranges of world wines are impressive which stretch from France and Italy to the Alsace and the Americas and feature Sauvignon Blancs from 2003 and a crisp German Gewurtztraminer from 2000. If you are lucky to dine here then ask the sommelier in advance about the 10 year old ports and sweet wines on offer. La Cave is another unique dining experience in the capital, however the prices are not for the faint-hearted. You’ll easily rack up well over £100.